Harrods is investing in digital screen and publishing technologies to engage with its customers. Speaking to Computer Weekly, Harrods media sales director Guy Cheston says the department store has always had a sense of theatre since opening its doors in the 1830s. “It’s always been an extraordinary and different shopper experience,” he says. And pushing on for being nearly 200-years-old, Cheston says Harrods has always been at the forefront of technology innovations. The store even prided itself on installing the first escalator in the 1890s. So many people were shocked by the invention, smelling salts were handed out as customers reached the top. “We’ve always been been keen to invest and stay ahead of the game,” says Cheston. 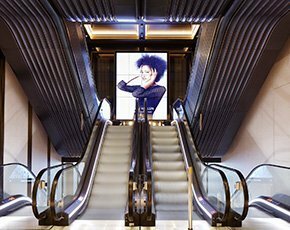 The luxury department store has been rolling out digital screens throughout its single store in London’s Knightsbridge for the past 11 years. The screens now display broadcasting messages, editorial content and brand advertisments in high-footfall areas of the store. And the next step is to look at interactivity, as well as using cameras to recognise gender and age. Cheston says Harrods is already investigating the possibility of replacing some video screens with a small number of large, high-impact video walls. “They’re bigger and we are looking at being interactive with a mobile device, to interact with content from mobile to screen and vice versa,” he says. The ability for a screen to recognise the gender and age of customers as they pass by and engage with the screen may prove interesting. Harrods is currently working with Quividi, which will provide the analytics around this technology, and the department store hopes to implement something in 2015. Cheston says this technology allows Harrods to understand and tailor its content to customers more effectively, while brands will have justification of their advertising investments. The data mining itself is handled by Quividi. “We’re comfortable with our footfall volumes, but trying to analyse who’s engaging will be quite helpful for us,” says Cheston. “And in the longer term maybe we could introduce day-time marketing, depending on footflow and certain retail days of the week which are busier than others. A lot of these customer-facing developments are conducted by the Harrods digital and marketing teams, while Wi-Fi and back-of-house IT is controlled by the IT team. Digital has played an essential part in the retailer's recent campaign of having key brands take over the store. Brands including Dior and Prada have used digital extensively as part of an exhibition to visualise key moments in the history of the companies, such as archived catwalk footage and displaying new fashion lines. Meanwhile, Harrods' other big investment has been in a digital version of its successful in-house magazine, which is delivered to 120,000 customers per month in the UK. A redesigned interactive digital version was launched around 18 months ago to reach out to its large proportion of international customers who have several homes around the world. “The way we see the digital content of our editorial through mobile is very much our future,” says Cheston. Harrods also launched a game – similar to Candy Crush – through its magazine, which coincided with the launch of a new shoe department. The game received 1.3 million screen views, which helped with downloads of the magazine as that was the only way customers could play. “At Harrods we’re trying to keep pace with innovation, and appeal to young customers and the customer of the future,” Cheston says.